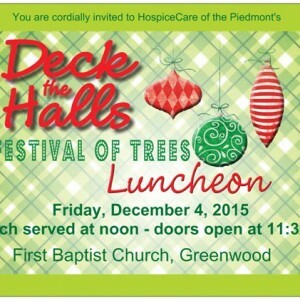 HospiceCare of the Piedmont presents the 24th annual Festival of Trees as the premier holiday event in Greenwood. All that attend the Luncheon on Friday, December 4th will get the first preview of the lavishly decorated trees and wreaths, as well as the delicious treats available at the Bake Sale. 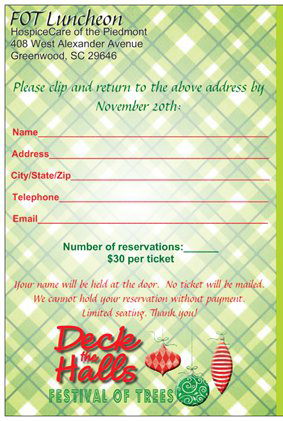 The Luncheon reservation card below may be printed, filled out and returned to us for your reservation to this event. 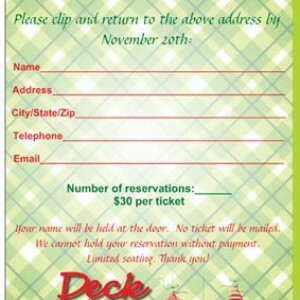 Cost is $30 per ticket.